New York City is not known for its music festivals. Sure, we have a lot of concerts here in the city year round, but festivals, not so much. Festivals usually occur outdoors over the span of two days and require large and open spaces from which to run. There’s not many open spaces in NYC except for Central Park in Manhattan, Randalls Island tucked away between Queens and the Bronx, Governors Island in the middle of New York Harbor, and Prospect, Commodore Barry, and Wingate Parks in Brooklyn. While there are a few exceptions here and there, these spaces are pretty much it in the city that are readily (for the most part) accessible to the public. The recent CBGB Festival in New York and Brooklyn utilized a different festival pattern: it wasn’t contained at one space, but spread over many small venues. The Governor’s Ball held its second annual two-day festival this past June on Randalls Island, the same day as a smaller and grittier one-day festival, Punk Island, occurred on Governor’s Island (not Ball!). The Afro-Punk Festival occurs every year at Commodore Barry Park, although the 2011 festival was cancelled due to hurricane. (Afro-Punk this year occurs August 25-26.) Outdoor shows happen at the Waterfront at Williamsburg, Prospect Park (Celebrate Brooklyn! ), and Wingate Park (Public Enemy with Salt-N-Pepa on July 30), but these latter concert spaces nor fledgling festivals can compare to Chicago’s Lollapalooza or Indio, California’s Coachella… yet. 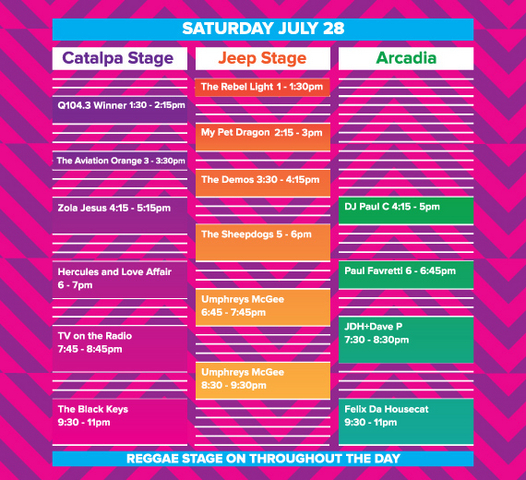 This year marks a new entry into New York’s up-and-coming festival scene: the First Annual Catalpa Festival that’s being held this weekend (July 28-29) on Randalls Island. The headliners are The Black Keys and Snoop Dogg, with support from TV on the Radio, Matt and Kim, Umphrey’s McGee, Girl Talk, and Matisyahu, among others. 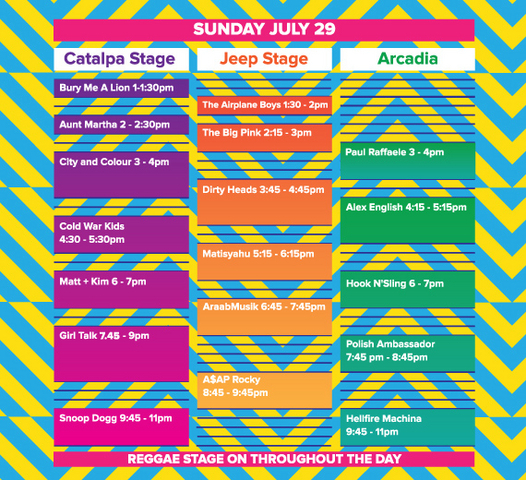 In addition to the two stages, there’s also a Reggae Stage curated by High Times Magazine, headlined by the High Times Cannibus Cup Band featuring Ros Droppa with a full slate of other reggae bands performing as well. Billboard.biz: What was your inspiration for Catalpa and why bring it to New York? Dave Foran: Bringing Catalpa to New York was trying to fill what, in my eyes, is a void for a large, well-done, comprehensive destination festival in New York. It’s one of the best cities in the world, and it doesn’t really have a festival to call its own…But what I’m trying to put together, if it’s done right, will have longevity. Essentially, it’s trying to establish something substantial that isn’t really here and is calling out to be done. Time will only tell if his festival becomes a mainstay in a city that seems to be adamantly opposed to them. Festivals in surrounding areas of New York haven’t been too successful, but maybe Foran’s vision of not only bands, but “experience” may be a key in a city that likes things just a little weird. So if you get tired of music during the two-day festival, you can go and get yourself hitched to a stranger at the “Frisky’s Church of Sham Marriages,” or check out the Arcadia installation of military scrap art and other art installations, or the Silent Disco Tent. If you’re a big spender (which, believe it or not, a lot of people in NYC aren’t), there are VIP passes complete with food, or a cabana with a hot tub and bottle service, too. If you’re not into that, the slate of music should be satisfying enough.